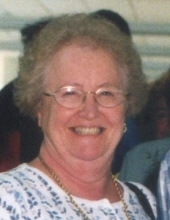 Sally A. Martin, age 79, of Zelienople, passed away on Thursday, April 4, 2019 while under the care of UPMC Passavant Hospital in McCandless Twp. Born December 20, 1939 in Wildwood, PA, she was the daughter of the late Harry Lightner and Evelyn Jones Lightner. Sally enjoyed cooking, baking and traveling. She was a loving wife, mother, grandmother and great-grandmother. She will be dearly missed and lovingly remembered. Sally leaves behind to cherish her memory her husband and best friend, Leonard J. Martin who she married in 1957; her children, Robert L. Martin of New Sewickley Twp., Susan (Douglas) Torbett of Daugherty Twp., and Lisa (David) Bauman of New Sewickley Twp. ; her eight grandchildren; her 16 great-grandchildren; and her siblings, Richard Lightner of Grove City, Sandra McFadden of Grove City, and Sharyn (John) Kawecki of Sandy Lake, PA. In addition to her parents, Sally was preceded in death by her son, Douglas Paul. Donations may be made in Sally’s memory to the American Cancer Society, 320 Bilmar Dr., Pittsburgh, PA 15205. Arrangements have been entrusted to the Boylan Funeral Home, 324 E. Grandview Ave., Zelienople, PA 16063. To send flowers or a remembrance gift to the family of Sally A. Martin, please visit our Tribute Store. "Email Address" would like to share the life celebration of Sally A. Martin. Click on the "link" to go to share a favorite memory or leave a condolence message for the family.